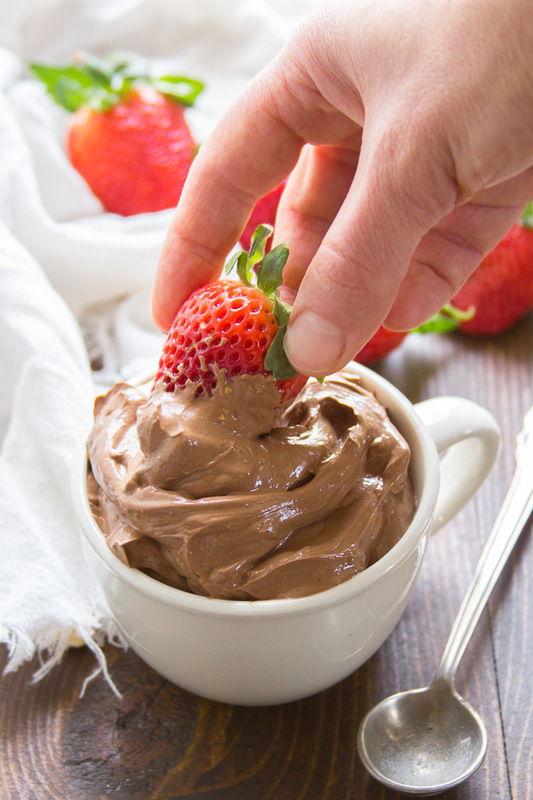 Super silky, oh so creamy vegan chocolate pudding that you’d never guess was dairy free…and it’s made from a surprise ingredient. You have to try this decadent dessert to believe it! This is one of those recipes that I’ve been making forever, but I rarely actually make. Why’s that? I can’t have it around. It’s seriously delicious and dangerously addictive. Having said that, I don’t feel as bad about eating it as I might with some desserts. Don’t get me wrong: it’s decadent. Definitely a dessert and not a snack. But it’s totally vegan, and guess what the main ingredient is? Tofu! I hope I didn’t just lose some of you. Pudding made from tofu doesn’t sound all that great. But we’re using silken tofu here, which actually works really well in creamy desserts. Silken tofu has a totally different texture from the firm or extra firm tofu that you’re probably used to using in savory recipes. 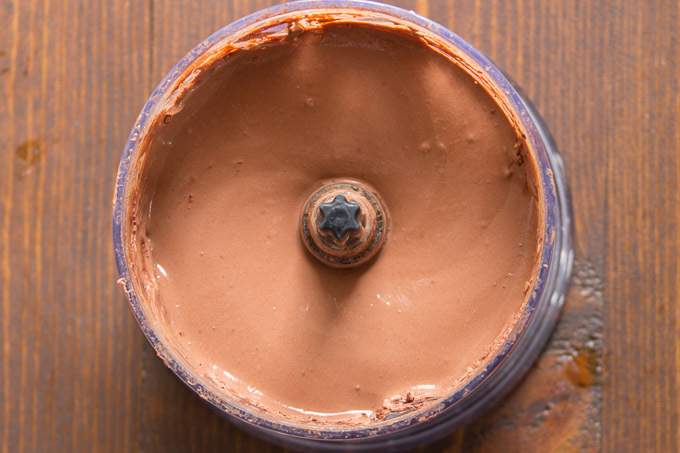 It’s super soft and super smooth, and when you blend it up, you end up with something that has about the thickness and consistency of pudding. I even use it in cheesecake! 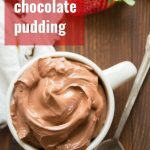 Add some chocolate and sweetener, and you’ve got an amazing tasting (and really easy to make) vegan chocolate pudding. Just place your silken tofu into a food processor bowl. Add some melted chocolate chips, cocoa for extra chocolaty flavor, maple syrup, and salt. 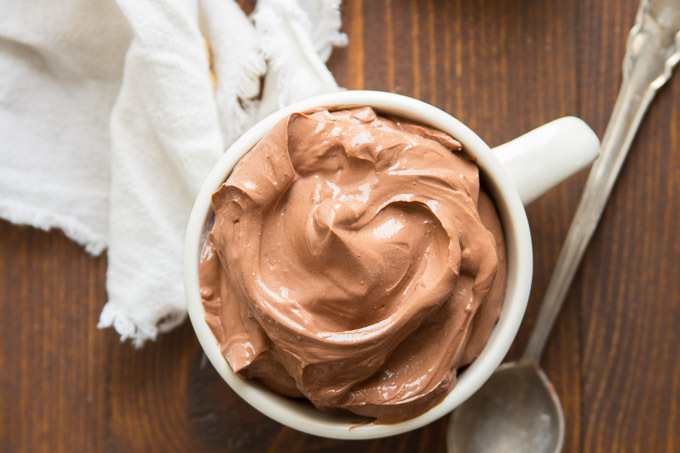 You can enjoy your pudding right away if you want, but it’s best if you chill it for a bit. Do I need to drain/press the tofu? Someone always asks this when I post a silken tofu recipe, and the answer is no. Silken tofu is barely solid, so it’s packed differently than regular tofu (there’s very little excess water), and if you tried to press it, it would completely squish! Some brands of silken tofu offer soft and firm varieties. Either will work, but if you have an option, go with firm. Where can I find vegan chocolate chips? I use Enjoy Life brand, and they’re available at my regular supermarket. If your store doesn’t carry vegan chips, try Amazon. Is this pudding gluten-free? It is! The pudding will keep for 3-4 days in a sealed container in the refrigerator. Is it freezer friendly? I haven’t tried freezing it, but I’m guessing it’s probably not, because freezing messes with the texture of tofu. Super silky, oh so creamy vegan chocolate pudding that you'd never guess was dairy free...and it's made from a surprise ingredient. You have to try this decadent dessert to believe it! Place the tofu, melted chocolate chips, cocoa powder, maple syrup, and salt into the bowl of a food processor fitted with an s-blade. Blend until smooth, stopping to scrape down the sides of the bowl as needed. Taste-test and add more maple syrup and/or salt, if desired. 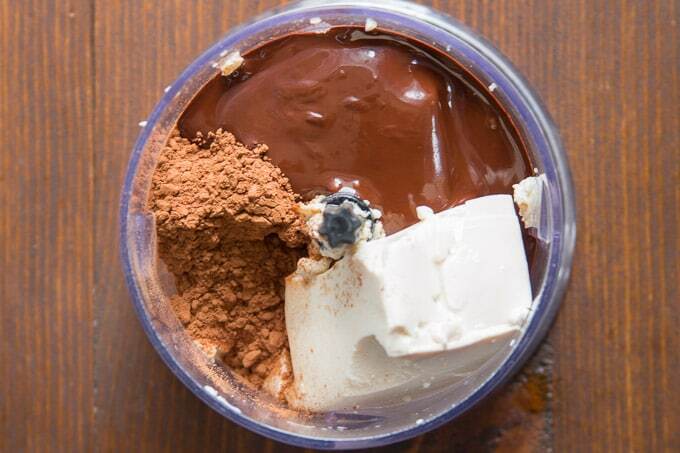 Transfer the pudding to a sealable container and chill until ready to serve. *If you prefer not to microwave, you can melt them on the stove in a double boiler. When you said secret ingredient, I knew it was tofu. I’m really liking soft, smooth, silken tofu in desserts lately. The texture is so creamy. This will be an easy and yummy dessert for when company comes over. I’ve actually served this one to company myself and people are always shocked that it contains tofu. :) I hope you enjoy it! It is pretty sturdy and I think it would work! I’d definitely use firm silken tofu if you can find it – Mori Nu is the brand I usually use. Enjoy! Can you use the silken tofu in the dairy case of the hard to find non refrigerator one????? I am afraid you and I are going to have to part ways. I LOVE chocolate and I love desserts – but I am allergic to soy. Also allergic to peanuts, and I think the 2 are relatives. I hate drooling as I start reading a recipe, only to find there is that pesky tofu word again! What can be substituted for tofu? 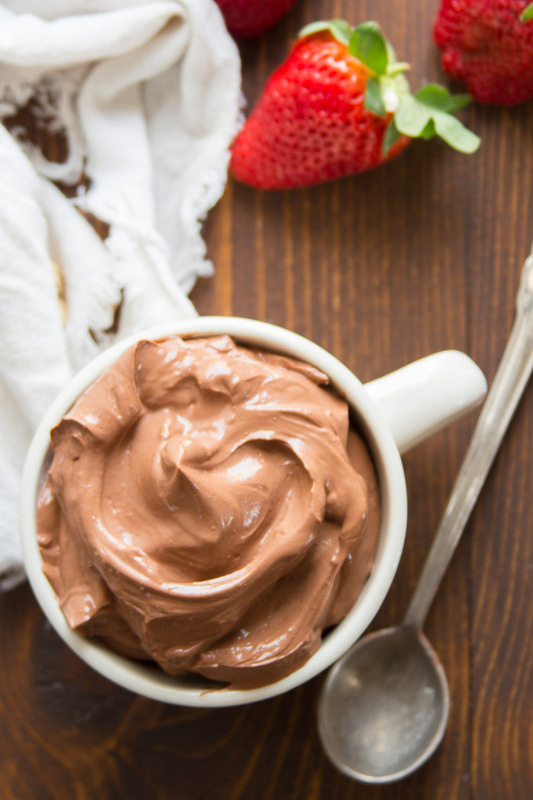 Avocado makes a great chocolate pudding! I’d guess 2 or 3 avocados, plus some non-dairy milk to thin everything out would work in this recipe. Wow! Just finished making this and will serve it tonight for dessert. I love the velvety creamy texture and am still shocked it has tofu in it. 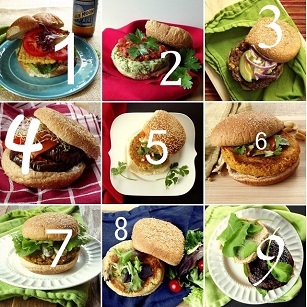 Love your blog and thank you so much for sharing yet another amazing recipe. Yay! I’m so glad you like it! Thanks so much Nan! Could coco powder be subbed for the chips? I tried that once (it was years ago) and if I remember correctly the texture wasn’t great – maybe a bit on the chalky side. The melted chips also help thicken it up, so it could be a bit on the runny side without them.